In the barn a few weeks ago, frustrated at failed friction fire attempts, I heard a faint peep from above. I saw a nest stuck against the frame of the roof near the center of the barn. It was made of mud pellets and straw and was heavily lined with downy feathers. Inside were three baby birds I had not yet identified. With some help from Jason, I learned that these were barn swallows. Barn swallows (Hirundo rustica), grow to about 7 inches and have a metallic blue backside with a deep orange front. They also have long tail streamers, which are feathers adapted for fast, accurate flight. As I climbed up a bookcase to get a better look at the babies, an adult flew into the barn and regurgitated some food into one hatchling's mouth. The other two about peeped their heads off, and as the adult left the nest she saw me. Her regular work interrupted, she began alarming and circling my head, flapping restlessly. The call was like an annoying, high pitched, loud hiccup. Annoying to the point where I let them be for the night. The Barn swallow's aerodynamic anatomy allows it to fly quickly through the air, and thus contribute to the ecosystem (and my peace of mind) by nabbing pesky mosquitoes and other insects in flight. 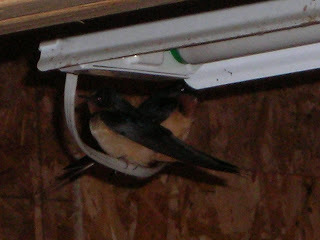 At any time during the day, one can look up to the sky from the barn entrance and see several barn swallows in flight. They are known to nest in colonies and participate in cooperative breeding, in which helpers, along with mom and dad, will often feed young. The following day, I returned to the barn to find two of the three babies dead on the floor of the barn. The third, still very small, repetitiously stepped up to the nest's edge and flapped. Two adults, perched on the lights to either side of the nest sang and occasionally flew up to poke at the youngster's wings. The following day I found the last of the brood dead beyond the other two corpse. Kerry graciously gave them a memorial and removed them from the barn. Activity in the barn slowed the following week and I went back to playing with fire... just smoke, rather. 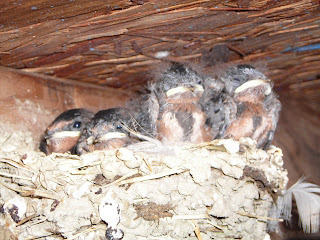 On the 4th of July, Filip informed me that, since it is early in the summer, these swallows may try for young again. As predicted, a second brood of four nestlings has been produced. These babies have a fluffed bundle of hay to land on if they get the urge to take off early. Today, there were only two in the nest and no evidence of any dead birds. The twp remaining are beginning to get color in their anterior feathers and the eyes are open wide, as the photo above shows. There is a lesson to be taken from these swallows: perseverance. Their young were lying dead on the floor of their home, but instead of mourning, these swallows got back to business. Their display of drive and dedication is apparent in their nesting and feeding behavior, and this second brood seems to be successful. I took this lesson and used it in making fire, and after ruining spindles, carving notches too small to hold a coal, and having five coals go out on me, I finally made fire... the catch... with store bought materials! sources: -Alden, Peter, and Dennis Paulson. 1998. National Audubon Society Field Guide to the Pacific Northwest. Chanticleer Press, Inc.